This is a new thread about a layout first described on a long defunct thread called, “And now for something completely different” in the Bar Section. I have done little actual work on it other than drawing an American back scene and using it as a temporarily switching layout and for photographing trains. However it didn’t seem to work to my mind so I replaced the American structures with buildings that looked far more British. 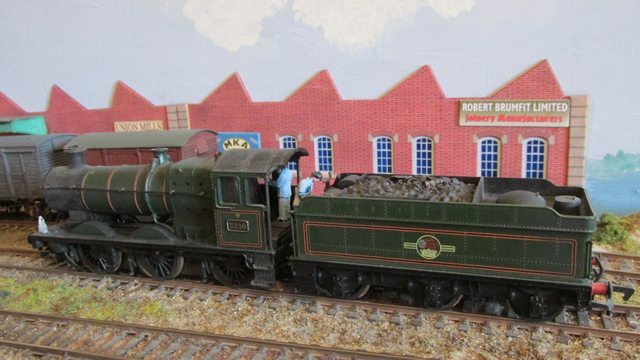 After all I have still have Benson my Switching layout to operate in American mode when I want to. While sitting at my PC the layout is at eye level and it is rather pleasant to be able to run trains up and down in front of one. It’s a bit like Giles “Just because I like it “ idea, which incidentally I thoroughly approve of. The loco motives are an eclectic selection purchased just because I like them. I am in the throes of photographing both my steam and diesel locomotives and stock and will post pictures of them in due course. 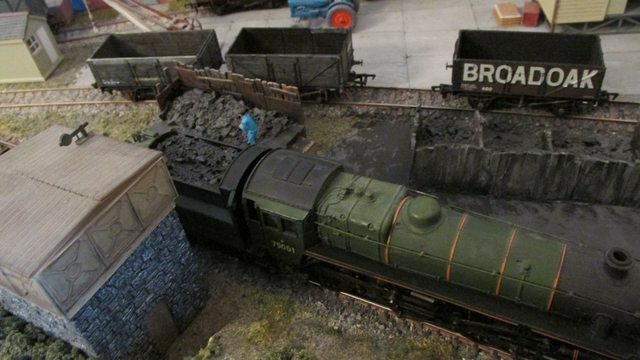 A couple of views showing the more British back scene with industries providing some traffic for realistic operation. Thanks for the BR pictures, Peter. Reminds me how much I used to enjoy the diversity of pre-Nationalisation parcels vehicles. 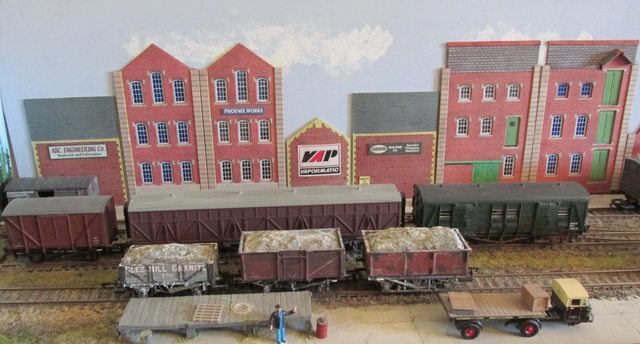 Thanks for that Giles, yes they are attractive, I have always had a soft spot for parcel trains. 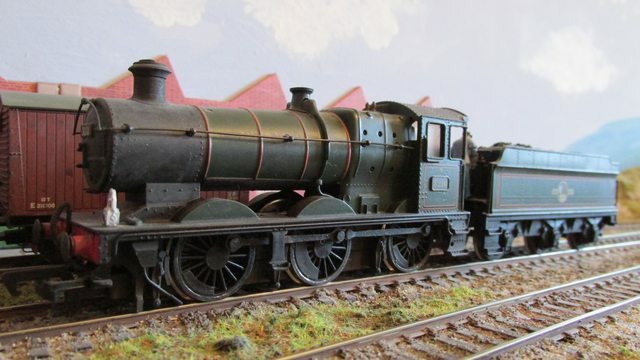 The first loco I bought to run on the model was a Hornby Collet 0-4-2 4800 class tank engine and although built fairly recently looked much older. 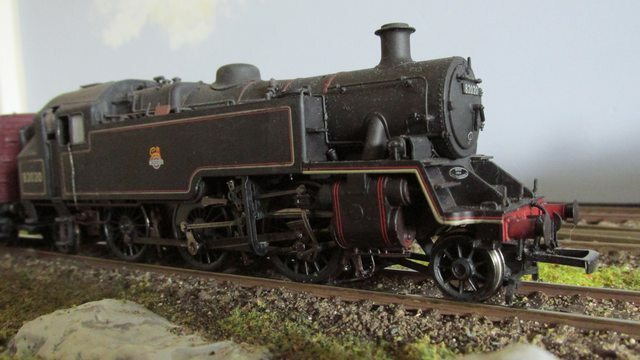 When introduced in August 1932 the class was designated “4800” in effect the deign was merely an up-dated version George Armstrong’s “517” class of 0-4-2T’s that were put into traffic from 1868 onwards for branch line and local work. 156 were at work but by the 1920’s and early 1930’s most were over 50 years old and being scrapped in large numbers. Pressure was exerted on the CME Charles Collett to a replacement for the Armstrong 0-4-2T and the result was the “4800” class. They were not greeted with much enthusiasm by the railway press as they looked rather Victorian with their tall chimney and dome. However the economic conditions in the 1930’s meant that extreme prudence was necessary when capital expenditure was being considered for motive power on lightly trafficked branch lines. So the revision of an old but successful design was a case of good housekeeping. In all 95 Collett 0-4-2T were turned out from Swindon works between August 1932 and April 1936. Note; The 4800 numbered series were auto fitted, the 5800 series were not. Enough of the history on to the model itself. When first purchased it ran reasonably well if with a slight limp. Removing the rubber traction tyres completely transformed it so that it runs much more slowly and doesn’t stall on dead frogs. It has a slight limp though, never mind I like her very much. She has just had a slight weathering so she looks used but well looked after. 4869 at rest between shunting moves in the yard at Willin Ford. 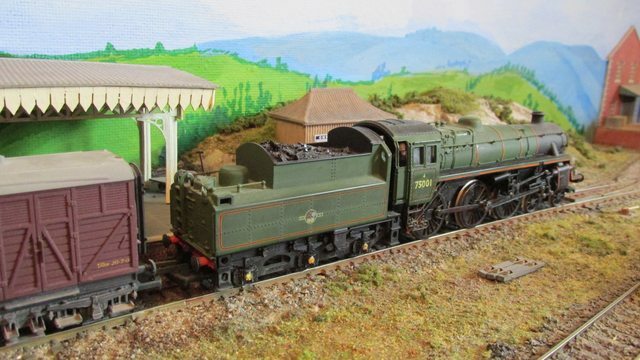 This BR prairie model was my second purchase and was on offer from a well known emporium in Liverpool. It is a bit modern for my taste really but I do like watching its valve gear when in motion. She is used for both passenger and freights and quite liked by the crews because of its roomy cab. The real ones were considered to be very heavy on coal so presumably not over popular with firemen. An interesting note, in a book I have by Colin Maggs it shows no 82044 working a Yeovil Pen Mill - Taunton train with its coal bunker sprinklers working to damp down the coal dust while standing in a station. The last two photos really show how well the loco stands up to close-up photography..lovely. With the 0-4-2 tank, do you have trouble with the driving wheel that has had the traction tyre removed, still having a groove in its tyre? 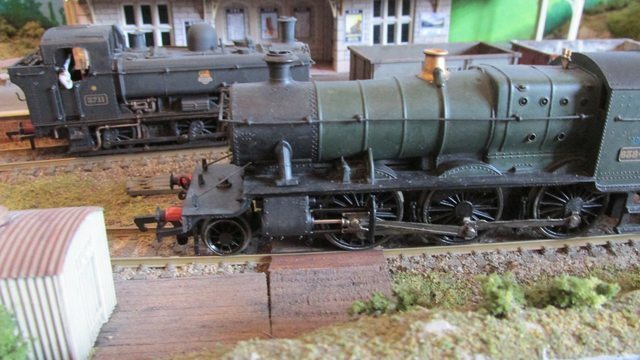 I can honestly say that I have had no problems at all having removed the traction tyre from the Collett 0-4-2. The track is code 100 so hardly fine scale, could that be the reason for no problems? 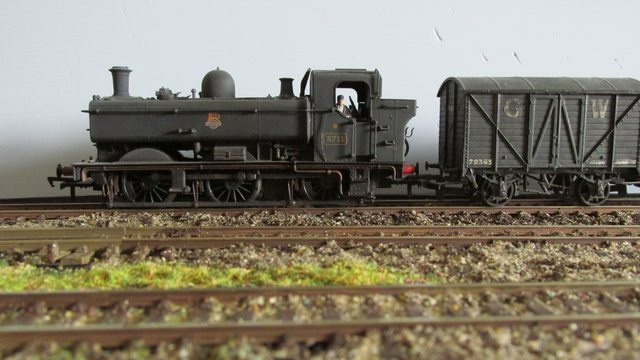 The GWR prairie is another small loco that I find very attractive, they were introduced 1906 and 175 were built. They varied slightly in that some had a flat topped tanks that held 1000 gallons of water and some had a sloping front to the tanks and these held 1300 gallons. 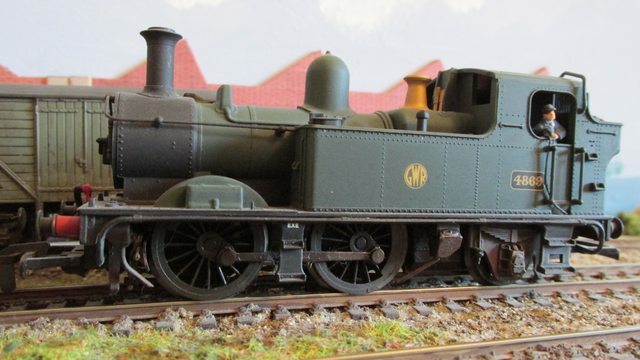 My model which is a Bachmann example runs very well and captures the look of the prototype very well I think. 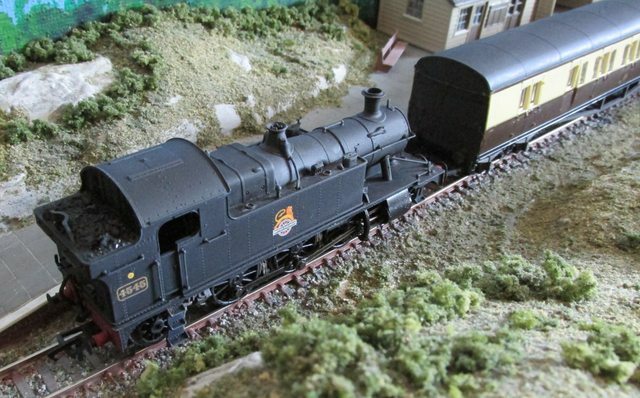 She is a useful loco to have on the roster as she equally at home at home on a passenger or freight working. 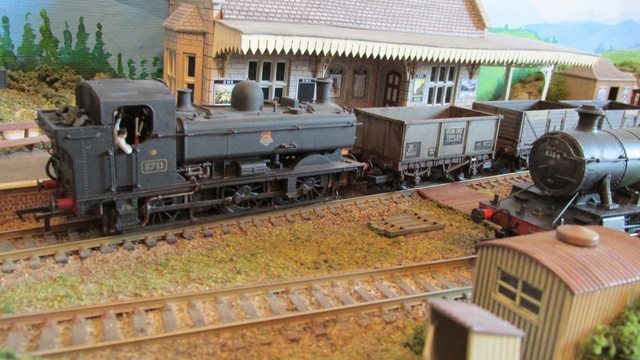 Ex GWR prairie 4545 is seen working a passenger train consisting of a B set. At rest in the yard at Willin Ford between shunting moves. A selection of shots showing 3711 at work. She is an ex GWR 57xx class which was a very large class indeed and could be found all over the system on various jobs. I remember seeing them as a train spotter at Paddington bringing in empty carriage stock and then giving trains a push as they started their journey to the west country. 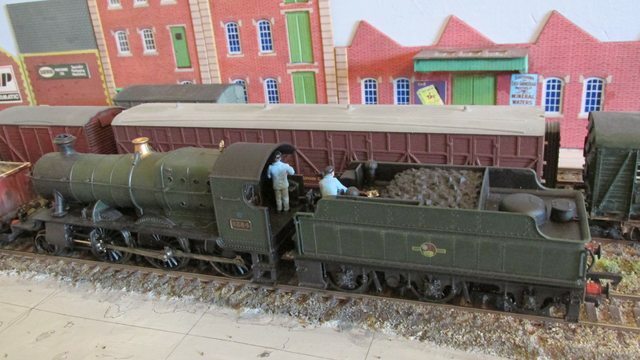 It is another Bachmann model and a superb runner, weathered to look work stained but not too dirty. A locomotive I have always found attractive but never owned an example of was the ex GWR 4300 class of mixed traffic mogul. 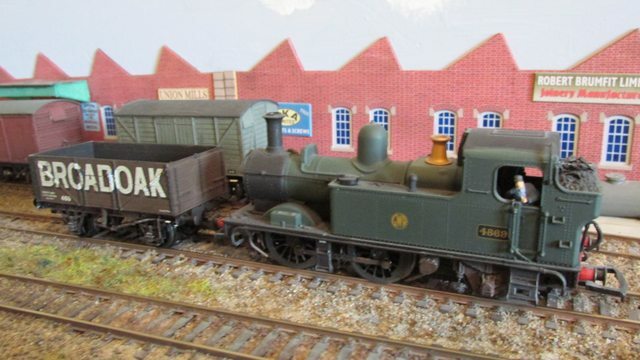 The model had long been out of production but I managed to get a second hand Bachmann one that had not been used very much, judging by its overall condition and lack of wear of the wheel treads. It seems to me that the model gets better each time she is run. The real locomotives were designed by G J Churchward and introduced in 1911 a total of 342 being built between 1911 and 1932. They were basically a tender version of the 3150 class of 2-6-2T engines with a standard no 4 boiler. Collett introduced 20 updated versions with a side window cabs and a screw reverser in place of the large lever originally fitted. 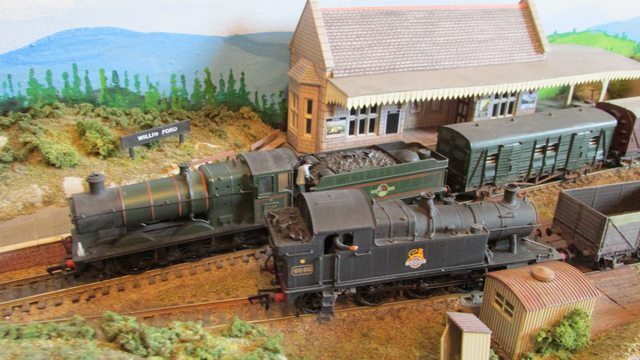 100 locos were rebuilt between 1936 and 1939 to the more modern specification. They were very powerful for their size, having a tractive effort slightly greater than a black 5. 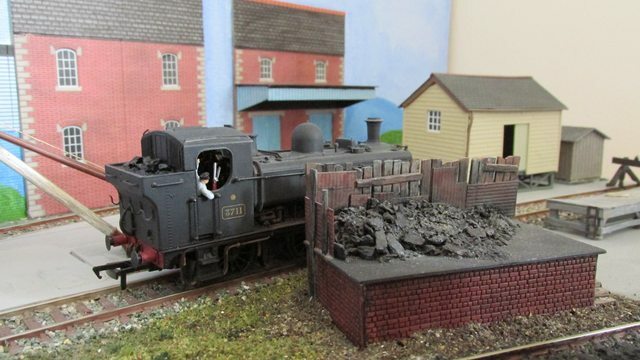 A few photos of my earlier version mogul no 6383 at work shunting in Willin Ford yard and station. Always good to see a big "train engine" doing it's own shunting instead of having a tank do all the work for it. 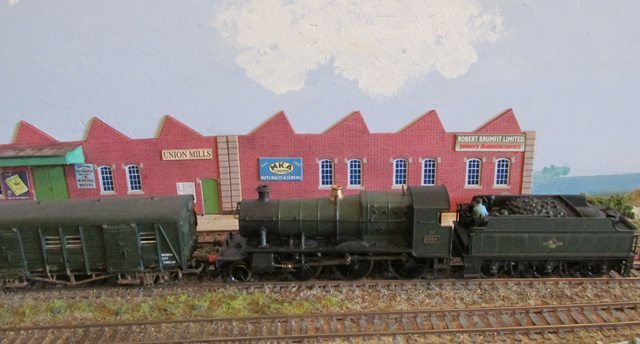 It seems lost on younger modellers, who have almost certainly never witnessed a local goods train, that most stations didn't have their own shunt loco and the train engine had to do everything. Of course, if this were more well known there'd be a lot less demand for toy train shunters, so the toy train makers want it keeping quiet. 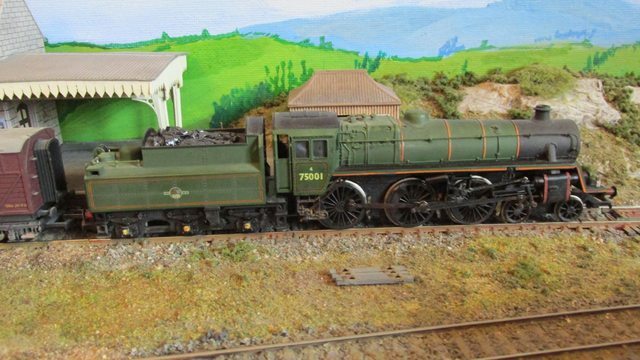 I think you have a point there Bob, actually the mogul 6384 is the biggest steam loco I have bought myself, I much prefer smaller ones. Of course the weekly “Fly” or local goods as it was known was an important train at most country stations. 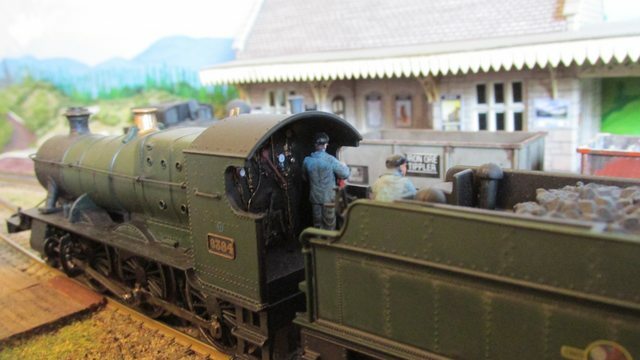 It was a good excuse for the station staff to play trains and do some real railway work for a while, as incoming wagons were swapped for out going ones. I have read that many loco crews were not over fond of working the “Fly” as they felt they could probably do the job a lot quicker if left to their own devices. 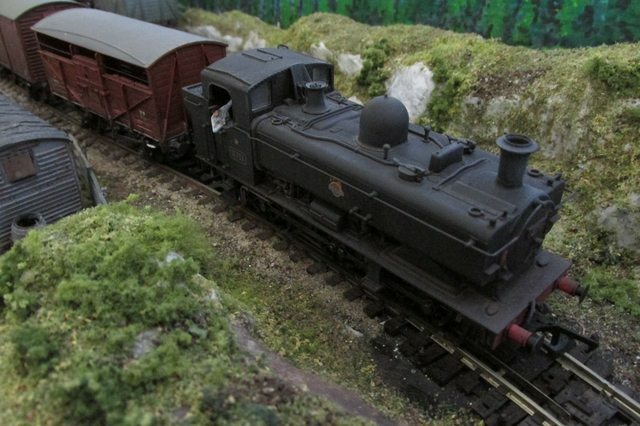 Sadly mixed freight, or goods trains are very much a thing of the past as it is all unit trains now. That is why I enjoy running my own “Fly as and when the mood takes me. 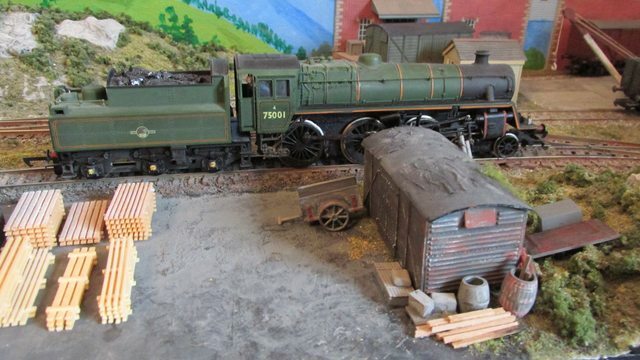 An old friend of mine gave me two locos he found in his loft when he was clearing it for some remedial work to be done. 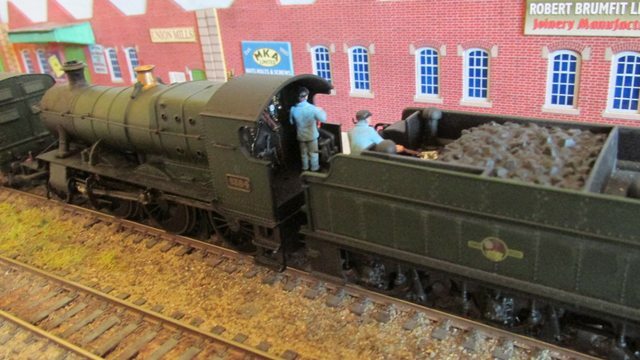 The first is an ex GWR 22xx class 0-6-0 tender engine found all over the system. I believe they were popular with their crews as they performed well and were fairly comfortable to ride on at low speed. 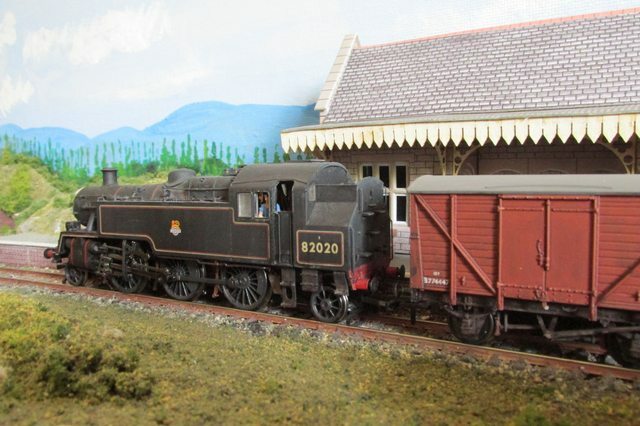 Three views of no 3210 at work in the yard and then departing from Willin Ford with a parcels train. 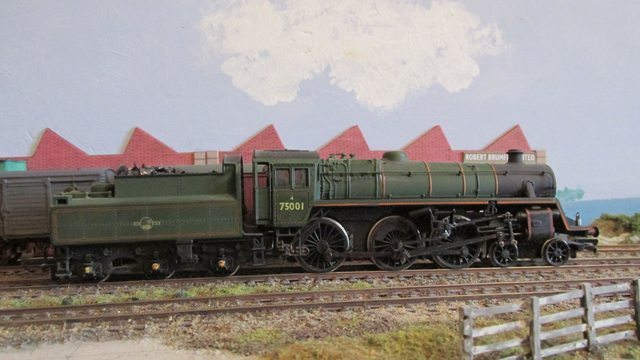 The second loco I was given is a Standard class 4 4-6-0 mixed traffic loco. 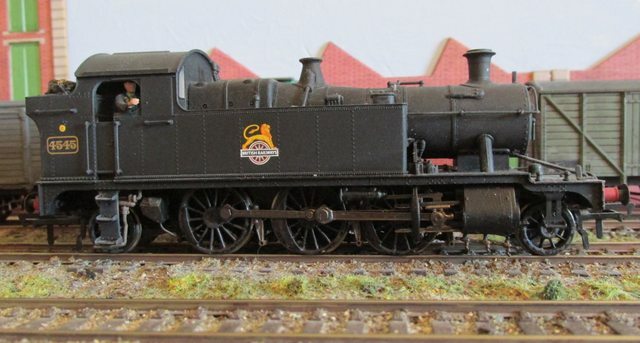 This loco like the Collett 0-6-0 is a Mainline model but has done little work and having been serviced and its wheel treads cleaned up runs quite well. The level of detailing is not up to modern standards but she looks fine at normal viewing distances. She is seen bring in another parcels train, uncoupling then running forward to replenish her tender with water. Having filled up with water she then runs round her train while the vans are being unloaded.